I have shared my rice bowls many times in the past, and they are some of my favorite, quick meals. However, the other day, I had a huge sweet potato that needed to be used, but I really wanted a burger. I didn’t want a bun, so I decided to make a burger bowl or deconstructed burger. I made my sweet potato into spicy sweet potato hash browns & then layered in the bowl with some mushrooms that I had sauteed in extra virgin olive oil and white wine. A mix, is a mix, is a mix, right? Not necessarily and definitely not when taking Non-GMO Verification into consideration. Glutino’s Gluten Free Pantry muffin mix is free of gluten and dairy, it is GMO free, and it is incredibly easy to use. I already apologize for giving you this recipe, because it is so good, you literally won’t be able to stop eating it. It’s also super easy to make, and will help you to impress any guests that may enjoy it as well (that’s if you are willing to share, of course). If you think making homemade gravy is harder than the SAT’s, think again. Instead of using a gluten-based roux (butter and flour), start using slurries. 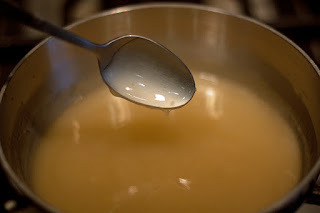 A slurry is a combination of a starch and cold water (equal parts) which are mixed into a hot liquid like chicken or turkey broth.